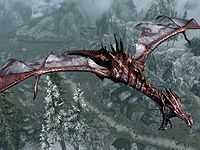 Odahviing is a red dragon whose name means "Winged Snow Hunter" (or literally "Snow Hunter Wing") in the Dragon Language. He was likely slain some time in the Merethic Era, perhaps during the Dragon War, although his soul was not devoured. Like many dragons, his remains were retrieved by members of the Dragon Cult, and he was buried in a dragon mound near the Skyrim city of Riften. The location of his grave was discovered through interrogation of Dragon Cultists by the Akaviri Dragonguard, and was later documented by the Blades in 2E 373. In 4E 201, Odahviing was returned to life by Alduin and became his ally. After the Last Dragonborn failed to defeat Alduin on Mundus, Odahviing was targeted for interrogation. The Dragonborn called his name through the use of the thu'um, which dragons perceive as a challenge. By following the call, Odahviing was lured into Dragonsreach, the castle in Whiterun which was used by King Olaf One-Eye to imprison the dragon Numinex in the First Era. With the help of the Jarl of Whiterun, the Dragonborn used an ancient dragon trap to capture Odahviing. Ensnared and defeated, Odahviing spoke with the Dragonborn and revealed that Alduin had retreated to Sovngarde. In return for his freedom, he agreed to bring the Dragonborn to Skuldafn Temple, an ancient ruin located high in the Velothi Mountains reachable only by flight, where a portal to Sovngarde was located. After Alduin's defeat in Sovngarde, Odahviing allied himself with the Dragonborn and provided aid in battle when called. He was uninterested in the Way of the Voice, and thought that Paarthurnax was foolish for trying to convert the remaining dragons to the philosophy. Odahviing remained at the Throat of the World, seemingly of no great concern to the reformed Blades. For game-specific information, see the Skyrim and Legends articles. ^ Esbern's dialogue in Skyrim.